Since we’re so electrified about the Chevy Volt and its Voltec technology, it may seem that some may have forgotten about another – perhaps even more important – alternative-energy project that General Motors has been working on since 2007. Project Driveway, an international campaign for hydrogen fuel cell technology, has been GM’s research project on hydrogen power running for the last three years. 119 Chevy Equinox crossovers outfitted with hydrogen fuel cell motors have thus far racked up more than 1.3 million miles worldwide. Since the inception of the Equinox hydrogen test units, however, advances in fuel cell technology have more or less made them obsolete. That being the case, General Motors is in the process of developing a second-generation fuel cell motor that will have less moving components, is nearly 220 pounds lighter (or one Eric Bentley), and uses a third less platinum (a precious metal that some rappers wear in their mouth). Plans are also in the works to make the liquid hydrogen storage components more compact, thereby reducing the set up from a cumbersome three tanks to just two. What’s more, the updated motor is being designed to fit in an engine bay of a typical four-cylinder engine. If that sounds like a dream come true, we should remind you that the only emission of a hydrogen fuel cell-powered engine is water. 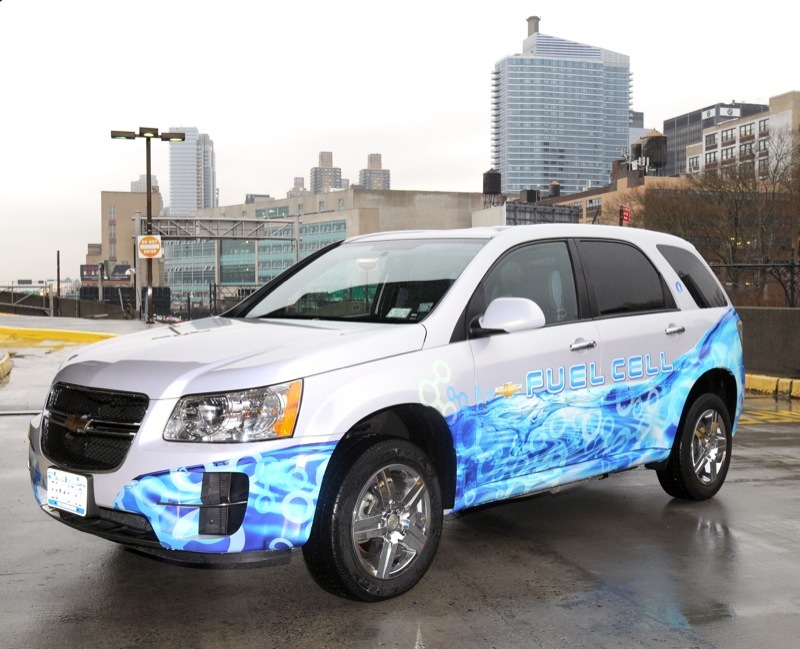 So why is GM working so diligently on hydrogen tech? The answer is rather simple – GM wants a “production intent” fuel cell program by 2015. What that means could be interpreted in more ways that one, but it seems safe to say that The General isn’t going to throw hundreds of millions of research and development funds into an all-new hydrogen fuel cell motor just for the sake of a PR gimmick. Given the constant issues surrounding gasoline fuel, including greenhouse gas issues and a rapid population conversion to neo-hippieism, more sustainable long-term energy solutions need to be presented than just the temporary bridge of hybrid technology – and GM is hard at work on making them a reality.